The first note of the existence of a monastery of San Pietro at Ace you have in an important and famous documentary source, a series of papers written between the years 714 and 715 a.d., when in Italy reigned King Liutprando. Starting from this data in 2010 was performed the first campaign of archaeological excavations in the locality of San Piero. The excavation was conducted by the University of Siena (d. S. Bell) in collaboration with the American University of Pennsylvania (d. R. Hodges). The intervention focused on two subject areas already identified in the past, on the Hill and at the podere San Piero. 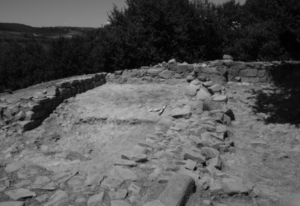 On the Hill have emerged traces of a powerful structure perhaps fortified dated between tenth and eleventh centuries.